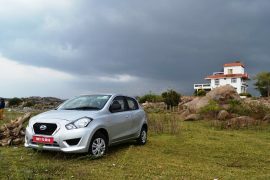 We spent two days in Hyderabad as a part of media drive by Datsun India driving the first small car offering from the company for India, the Datsun Go. 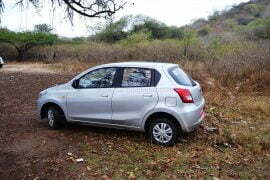 It will go on sale towards end of March 2014 across India. 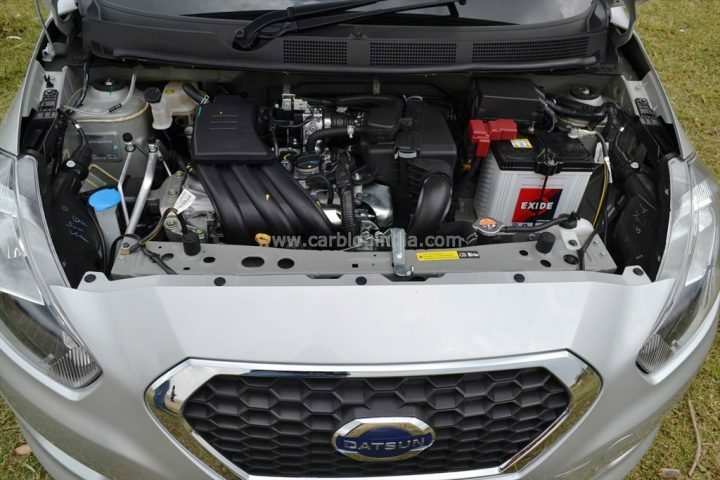 We got a chance to interact with the top officials from Datsun and Nissan and got to know more about the car and its development. 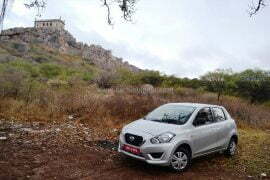 We drove the Datsun Go in different driving conditions in these two days including smooth expressways, congested city roads, moderate inclines and some bad roads; we tested how this car manages the ride quality and how comfortable the occupants feel when that car goes over not-so-perfect Indian road conditions. We share with you our first drive experience and Datsun Go review, our take on the car including exteriors and interiors design. 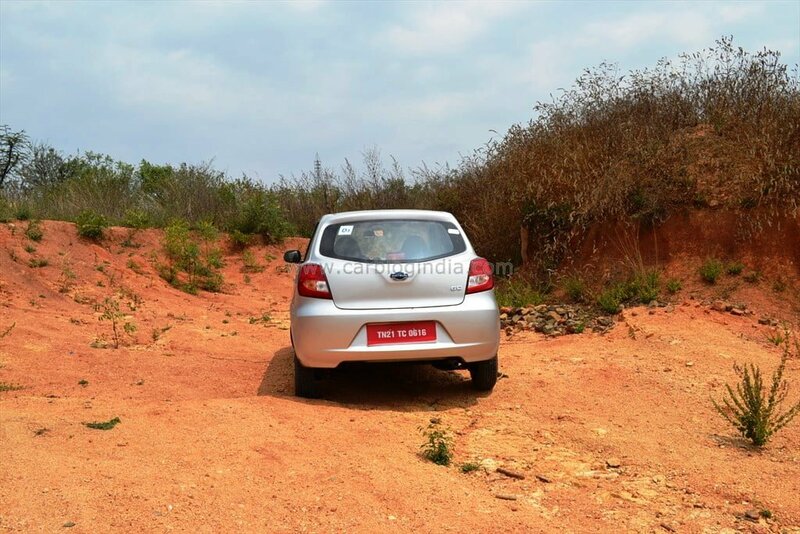 We will also talk about the features, performance, specifications, ride and handling of the Datsun Go in our complete and comprehensive test drive review and we have also done a video review for you if you want to know the car closer and in detail. 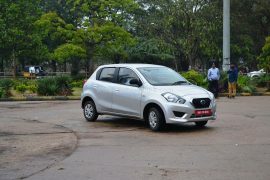 Datsun had promised that the Datsun Go would be priced below the Rs. 4-Lakh mark and it has stuck to that. The design of the Datsun Go is one of its strong positives. 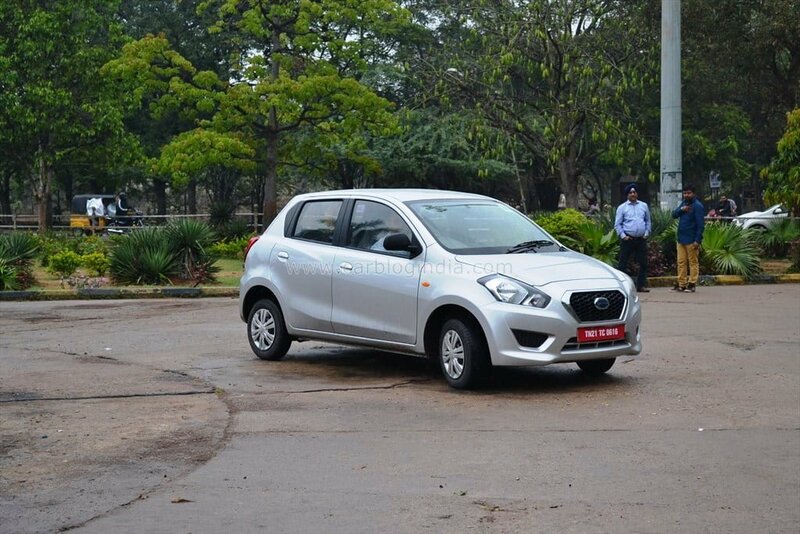 It looks very modern and nicely designed with a large hexagonal grille, some chrome treatment on front, nice looking headlamp cluster. The side gets body-lines which makes the car look more dynamic. The rear is designed in a nice and curvy with the rear windshield also curved nicely to complement the overall modern look of the Datsun Go. The size of the Datsun Go is largest in the segment so it has a good road presence too. The length is around 3.7 meters which also translates into a lot of usable interior space; we talk about it in our next section. 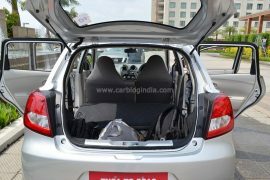 One thing we noticed on the outside which is different from most cars is that it has only one wiper at front (a cost-cutting measure) which is large and works very well. 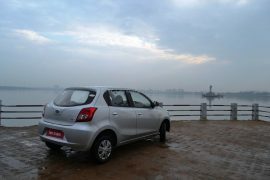 We got a chance to drive in mild rain and we did not find any problems with visibility because of the single wiper blade. There were a few things that were noticeable by their absence; first there are no internally adjustable outside rear view mirrors, they are not available even as an option. Second, and this is more glaring, is the lack of any boot opening handle or keyhole on the boot door; there is only one way to open the boot which is by using the boot release lever provided on the driver side on the floor. The first omission is not very bad, but the omission of a boot opening handle/keyhole is certainly a big mistake, we think. The good thing is that these two features are not a deal-breaker for customers who buy cars in this price segment (under Rs. 4 Lakhs). Before I start talking about interiors, I must mention that in terms of price point, Datsun Go sits in the segment where we have cars like the Hyundai Eon, Maruti Suzuki Alto and Chevrolet Spark. Compared to all these competing cars, the Datsun Go is much larger, especially on the inside. 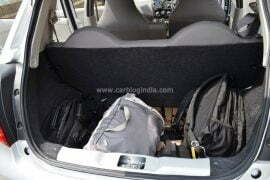 There is much better interior space compared to the competing cars for both passengers and luggage. Starting with the front seats, there is a full bench unlike the conventional design where we see a gap between front two seats. This gives it kind of a retro look, but Datsun designers told us that it adds to convenience in two ways – 1) It helps to get in and out of the driver seat from either side in situations like a tight parking lot, 2) It helps to keep small stuff like a bag or other things on the flat bench which is easily accessible to driver and front passenger. 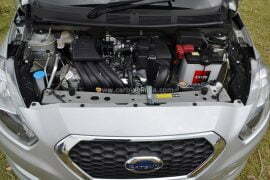 We are not sure whether it also helps to save some cost or not, but it is something very different. The dashboard design is simple and elegant; the instrument cluster is very simplistic with one large analogue speedometer with a multi-information LCD display. The digital gauge shows a tachometer, fuel gauge, and trip-metre as standard. A push butoon toggles between the temperature gauge, odometer, trip-meter, distance to empty (approx range), real time mileage, average fuel mileage etc. This digital screen is a first in this price segment. 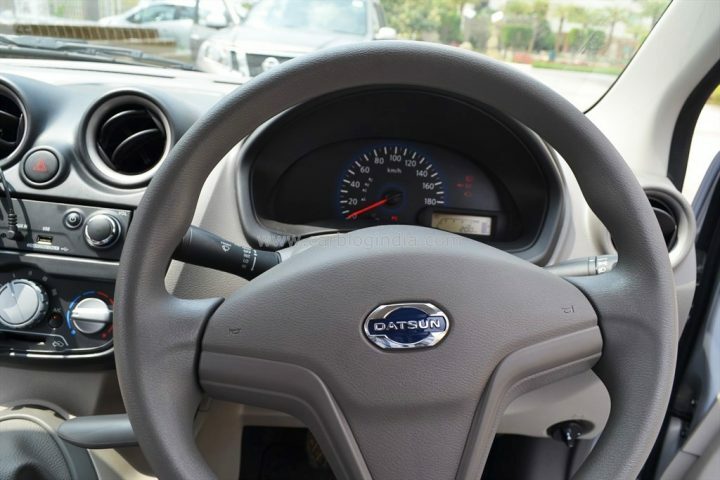 There is a simple and neat looking 3 spoke steering wheel, deep door pockets on front two seats, some cubby holes on both driver and passenger side. The Datsun Go does not get a lockable glovebox, but the two crevices on the passenger side of the dashboard are pretty spacious. There is manual AC with heating and has simple and easy rotary control knobs. 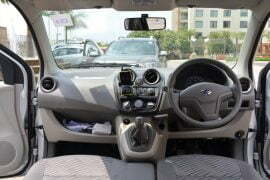 The front two doors on the top end variant get power windows, but interestingly, the driver cannot control passenger side power window, both driver and passenger have one power window switch just for their own power window. The central console has the gear knob below the AC controls and towards the left side of it there is a 12 Volt power socket for charging phones and laptops etc. On the right side of gear knob is hand brake rod, it is again something different from what we are used to of seeing in most modern cars. 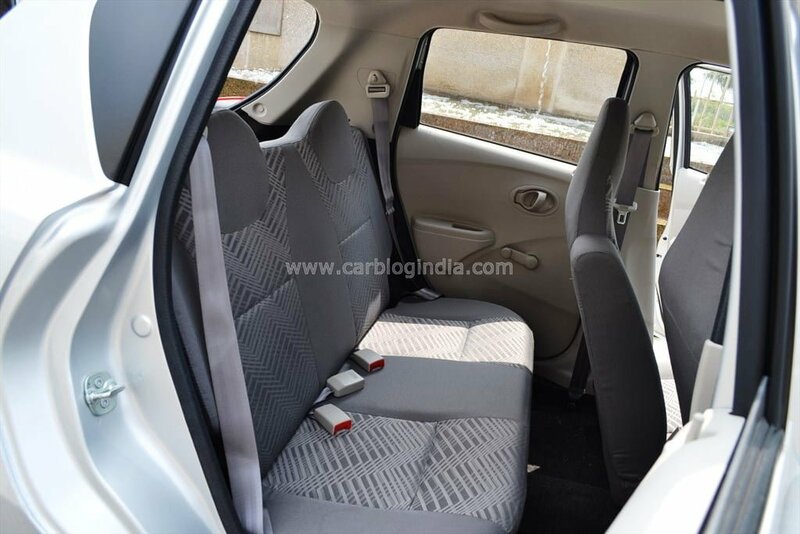 There is decent leg space for the rear seat passengers even when the front seat is set for a driver/passenger who is upto 5.7 feet tall. The seat is also more of a flat bench and has decent comfort level. 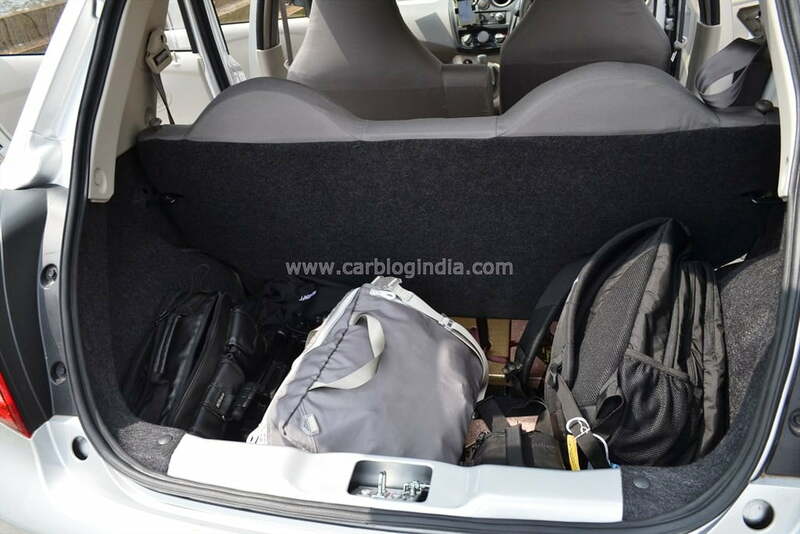 Moving to the boot compartment, there is lots of space here, 265 litres to be precise which is better than all competing cars and offers easy loading and unloading as the loading height is not too high. 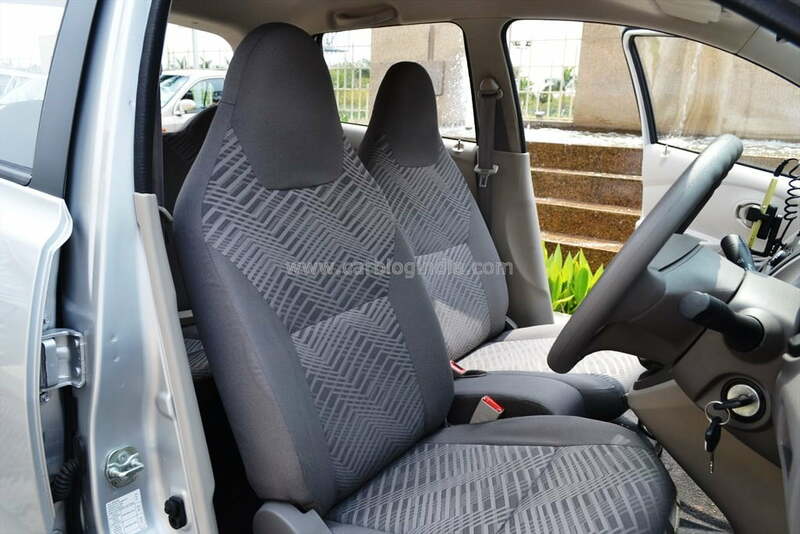 When you need even more space, the rear seat can be reclined (as full seat, there is no 60:40 split). The rear seats do not have any door pockets and come with manual windows; there are no power windows on the rear even on the top end variant. 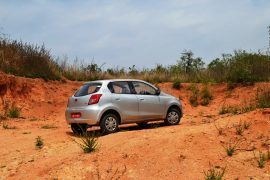 Overall the cabin is roomy and the quality of materials used on the Datsun go is of satisfactory quality. It may not be the most premium looking cabin, but practically very useful and gives a very spacious feel when you sit inside the Go. 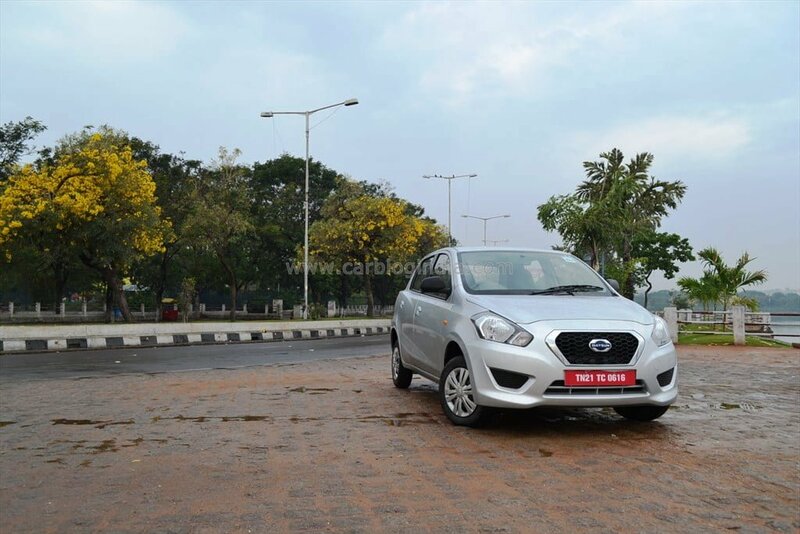 Usually cars in this segment are very basic and buyers don’t have too high expectations when it comes to handling, but Datsun Go is different here too. It uses a good suspension setup with higher suspension travel which makes it fairly comfortable on good roads as well as bad roads. 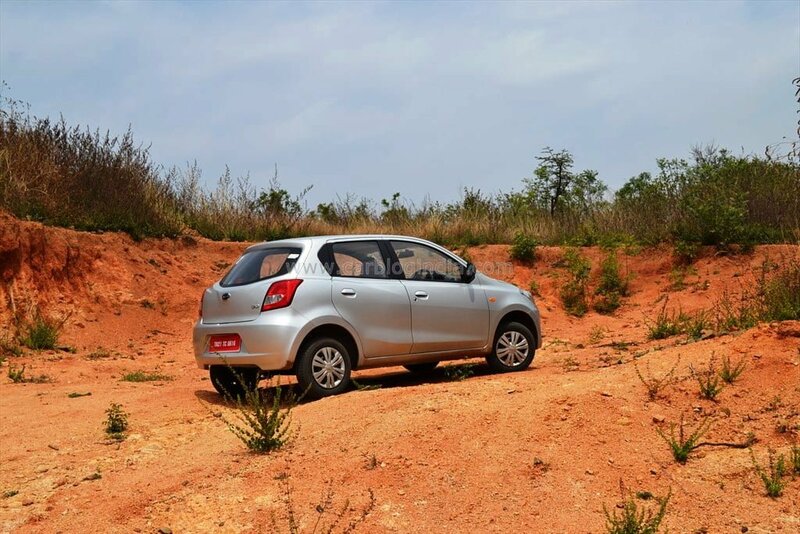 Also there is a short turning radius of 4.7 meters which makes it easy to maneuver combines with a light weight electric power steering and slightly larger in diameter than average steering wheels in this segment. 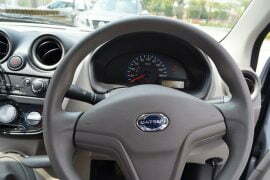 The power steering becomes slightly heavier at higher speeds for better control and confident driving experience. 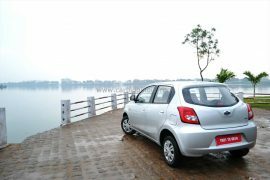 The ride is comfortable and handling is fairly good with slight body roll at too sharp cornering, but it is unlikely to experience the same in city commuting as this roll is noticeable only at speeds in excess of around 80 KMPH at sharp corners, which is seldom done on a city car. 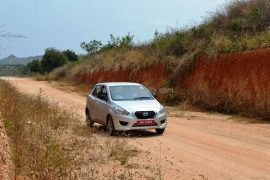 On our test drive we were able to achieve speeds of up to 140 KMPH without feeling any nervousness from the car, which is really good for a small car under Rs. 4 Lakhs. With the power delivery being strong at mid end, it reaches 100 KMPH without any major effort, however after 120 KMPH, the power trails off. Overall, ride and handling are nicely tuned for the Datsun Go and we find it aptly tuned for a city environment and it does well on highways too with a peppy engine. With a 3-cylinder, 1.2 Litre MPFI Petrol engine producing 67 BHP of peak power @ 5000 RPM and 104 Nm of torque @ 4000 RPM, the Datsun Go is one of the most powerful engines in this segment. 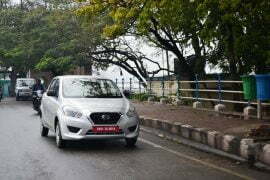 Also it has been tuned nicely for good low end torque and high mid end power, so it is easy to drive in city with fewer gear shifts and gives good acceleration on highways too. Gear ratios are tall, so we had to downshift sometimes for executing a quick overtake maneuver. The ARAI mileage of this car is 20+ KMPL and in our tests, we observed real time mileage being delivered close to 13 to 15 KMPL after enthusiastic driving. 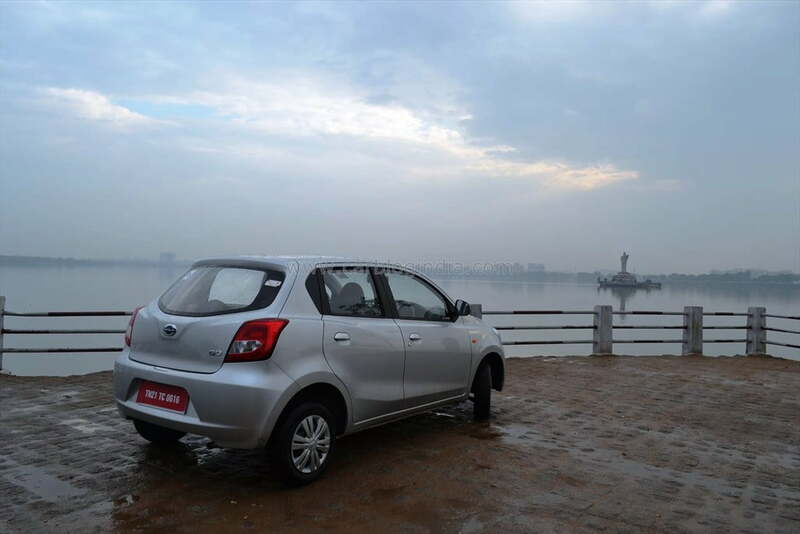 However if driven with a light foot, then it should be able to deliver a real world mileage between 15 to 18 KMPL. Mobile docking station- There is no integrated audio system, but there is something called Mobile Docking System (MDS). It holds any standard phone and connects via Aux cable. There is also a USB cable to charge the Smartphone on the MDS only. Hydraulic clutch- Also called power clutch by some brands, a hydraulic clutch reduces the effort required to press the clutch and hence makes the driving experience less tiring especially in stop and go traffic where use of clutch pedal is higher than usual. A standard audio system option would be better for buyers who want to opt for a regular system.